I agree to be part of the beta test immediately. There is no need to twist my arm. The email comes from Veronica’s Test Kitchen. 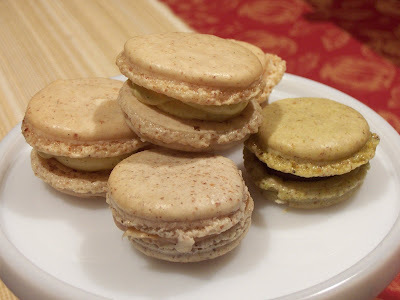 “I’m sending macarons,” writes the proprietor of the blogosphere’s most prestigious center of culinary science. Veronica is my hero. She can give Harold McGee a run for his money. Her keenly insightful kitchen experiments have taught me a thing or two about organization, attention to detail and using your powers of observation in the kitchen. Her macaron marathon was a tour de force, and now she’s taken the enviable step of opening her own patisserie, Petites Bouchees, offering exquisitely-crafted French macarons to the city of Richmond, Virginia and beyond. Veronica is turning her passion into a delicious vocation. I can see why Veronica has taken to this grand culinary tradition. The package is due to arrive on Wednesday. I check the front steps several times but nothing has arrived. 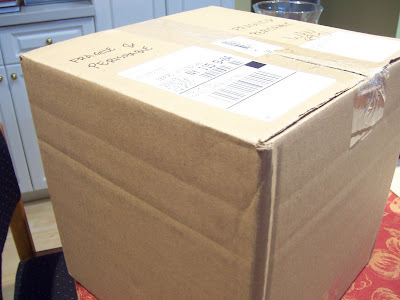 On Thursday morning, I am racing from the house to catch a train, and I spy the delivery box on the front steps. It must have arrived after dark. I return to the house, deposit the contents of the box in the refrigerator, and catch the next train to Manhattan. During the work day I am driven to distraction. Visions of macarons are dancing through my head. In the evening I arrive home and immediately take the precious contents from the refrigerator. 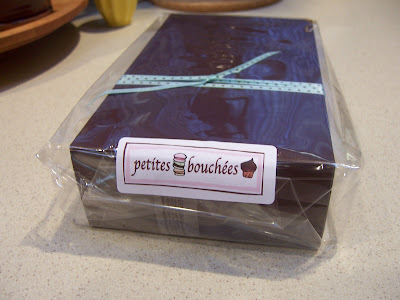 The macarons have been packaged in a sleek, slender cocoa-colored box. It is tied with a teal ribbon, decorated with brown polka-dots. Carefully, I break the plastic seal, slide out the box and slowly raise the lid. 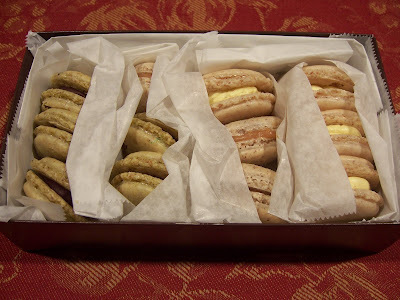 My eyes fall on a dozen pristine macarons, meticulously-shaped and packed in neat rows. 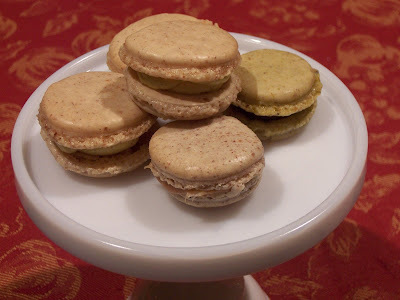 I pick up a macaron and take a sniff – the aroma is nutty, sweet and fragrant. The soft, pastel hues suggest the French countryside: Vanilla filled with a sunny Madasgacar Bourbon Vanilla Buttercream, sea-green Pistachio filled with Chocolate Ganache, and wheat-colored Hazelnut filled with Salted Caramel Cream. I taste a stylish Vanilla macaron. The outer texture is firm and the inside is soft and chewy. The buttercream filling dissolves in my mouth like rays of sunshine. I taste a second … a third … a forth. I’m beginning to understand Veronica’s obsession with macarons. In a short time, I have consumed eight macarons. I take my responsibility as a beta tester very seriously. Of course, this is purely an experiment to determine which variety is my favorite. It’s a tie. I love them all! Tres magnifique, Veronica! Merci beaucoup! Life is as sweet as a macaron in my book! I'm glad it got to you okay. After sending it to New York, Florida , South Carolina and Ohio and having positive results - I now decided to start shipping :). Thanks so much for your participation in this beta test. But most of all, I am glad you enjoyed them. How exciting! I just noticed on Veronica's site this morning that she is going to begin shipping her wonderful macarons this month. After following all of her posts in the test kitchen, I couldn't be more excited that I can now sample the macarons here in Rhode Island. And thank you, TW, for being such a willing beta tester. Hard, I know, but someone has to do it! What a wonderful thing to get in the mail! They look exquisite. Wow, you're one lucky man!!! Hi Veron - it sure beat the usual bills and catalogues! Thank you so much! Lydia - I will willingly sacrifice myself again! Lidian and Maryann - I have now been inspired to try and make them myself. Jeena - Welcome and good luck with your forum! Valentina - it gave new meaning to the term "special delivery!" Lucky Lucky you! Those look so heavenly! I am with you - it is easy to twist my arm with anything related to food - but these are in a whole other league! Life could NOT be sweeter than that!! How wonderful. Tough being a tester, isn't it? But it looks like you soldiered through it, brave TW.